In 2010, I was recovering from labrum surgery and taking my life back. The previous two years a severe stomach/GI issue took everything. My inability to stay healthy led to loss of jobs, ability to exercise, and many other things. It almost took my desire to live, but I refused to give up! A good friend and old colleague had moved to Southwest Florida during this time. He got into crossfit, then coaching, and eventually opened his very own affiliate. His gym was growing fast and he needed people he could trust. We got our starts in the fitness industry together in February of 2007 and worked alongside each other for several years. With a few years experience in personal training and management, there was an opportunity for me as a crossfit coach with potential to open and run my very own box someday. It took a year of convincing, but I finally took a trip out to Naples, Fl in October of 2011 to check it all out. The trip went great and Naples was a very beautiful place, not to mention change from the desert. Despite having no crossfit experience, diminished fitness levels myself, and a recovering shoulder he had full confidence I would be a great coach and fit for his team. I was excited about the opportunity and moved out to Southwest Florida a few weeks later. The members were amazing and I was surrounded by great coaches/mentors!! Over the next five months I shadowed, studied, and coached under supervision while soaking up everything I could before taking my Level 1 crossfit coach course in March of 2012. I was also working hard on my own fitness goals during this time and technique. To give an idea, I couldn’t OHS (overhead squat) more than a 35# bar, do dips, or pull-ups when I started crossfit in November of 2011. I can now OHS more than 200# and over 25 pull-ups unbroken. Still a long way to go on my own fitness goals, but I’m more focused on being a better coach than being a better athlete. My cardio was terrible at best and crossfit was extremely humbling for a former athlete. The best part about all of this experience was, the people I was surrounded by everyday in the crossfit community. So to speak, I drank the ”kool-aid” and fell in love with crossfit! Unfortunately, living 2500 miles away from family proved to be very tough. Opportunity to open another box and expand fell through, so I decided to move back to Arizona. Now back in Az, I hoped to keep my life as a crossfit coach. With limited options, I went back to doing what I was before getting into the fitness industry. Commercial concrete construction management wasn’t even close to my first choice, but seemed the smartest option at the time to survive and keep bills paid. Over the next two years I lost sight of the things I loved to do and any balance in my life. During this time, crossfit training and a little coaching were still a part of my life. It was very spotty, never consistent, and no longer a priority in my life. I was stuck in a toxic environment and wasn’t happy with my life. My company sent me to a Dale Carnegie course that opened my eyes back up!! Little did they know that a course they paid for would lead me right back to where I truly belong. The course talked about balance in life along with many other things. In October of 2013 I decided to make a change and find my way back to the fitness industry one way or another. With neck injuries from many years of football and my bad shoulder, mobility and corrective exercise became a big passion of mine. Began studying and practicing the work of a corrective exercise specialist to help others with their own issues while preparing to switch careers again. Finally, in April of 2014 I left the construction industry and started working part-time as a corrective exercise specialist. This allowed me to start training again more consistently and opened up time for a part-time coaching/personal training position somewhere. I posted a Facebook status reaching out to those I know, looking for a part-time job as a crossfit coach or personal trainer. There were several responses with options to get back into the fitness industry. Joy insisted I come check out Sol Crossfit and meet the owner Lance. The very next day I dropped in for the noon class and to meet Lance. It went very well and I loved what I heard and experienced while there!! Two days after posting about looking for a job, Lance and I met for lunch to discuss possible employment. The rest is history! I’m extremely excited for the opportunity to work with so many amazing people and be a part of something great! Little background about myself as an athlete and trainer/coach. I played minor league football throughout my twenties and had to stop due to severe neck issues. 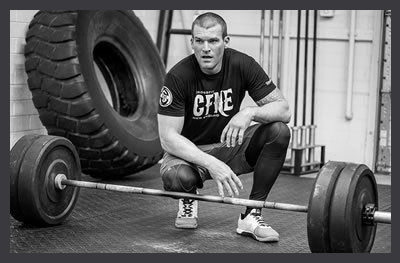 NASM CPT, CES, and Level 1 Crossfit Coach. Answer to questions: Crossfit off and on for almost 3 years now, close friend that opened his own affiliate in SW Florida Fran, short and not so sweet! Running! Anything that gets the blood pumping: Game of Thrones, Sons of Anarchy, pizza, and ice cream.